Despite the stress of finals, Rutgers University students are taking a break from their studies to advocate for Israel… through paint. Last Wednesday, Rutgers Hillel set up a 20-foot mural in front of their building on College Avenue for students to graffiti about Israel. 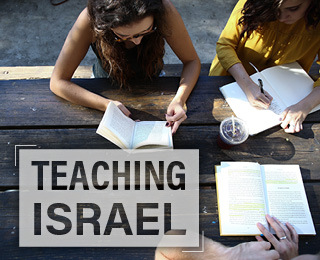 The program, entitled “Positively Israel: Art4Israel,” has been conducted on over 30 different campuses across the country and is sponsored in partnership with the Jewish National Fund. Other campuses that “Art4Israel” has visited include University of California, San Diego, University of Florida, University of Pennsylvania and the University of Vermont. Soon after Operation Cast Lead, the organization realized that art could provide an ideal medium for Israel advocacy. It didn’t take long for the group to evolve into a program that sends professional artists to college campuses to engage students and teach them to implement strategies through art.